A CHRISTMAS COURTING by Jennifer Moore, Chalon Linton, Jen Geigle Johnson, Heidi Kimball. I really enjoyed this collection of Christmas stories. I have read things from all but one of the authors and found that these stories we equal to their other books. Each couple was fun to follow through their journey. I didn't feel like I missed out on anything, although it's always nice to have more with characters you enjoy being with. I loved how some of the others referenced characters from other novels. It felt like an addition to that particular novel. 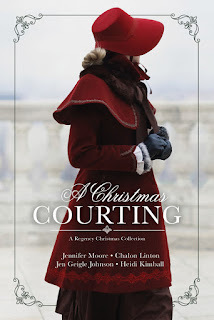 It was a delightful addition to Christmas love stories and a great way to begin the crazy holiday season. I would highly recommend it.